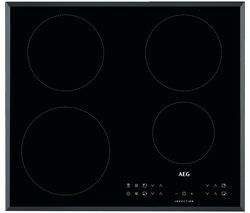 Whether you’re looking for an electric induction hob or a gas hob, AEG is a name you can trust. Synonymous with first-class German build quality and beautifully realised technological innovation, AEG have a long-standing reputation for stylish kitchen appliances that you can trust. Take the popular OptiHeat HK654200FB Electric Induction Hob, a sleek black hob that heats up quickly, delivering heat to the pan and nothing else, meaning you’ll spend less time cooking reduce your energy bill. The HK654200FB offers extra efficiency thanks to the OptiHeat Control which tracks the level of residual heat for each zone – it will let you know if the zone is still hot enough to cook with or keep food warm. Like all AEG hobs, the HK654200FB offers sensitive touch controls let you select the precise level you need for the best results, whether that's a low, gentle simmer for a pan of milk or an intense heat for pan-searing steak. As any chef will tell you, the precise delivery of heat is vital when you’re cooking on the hob and this sophisticated AEG hob delivers instant, incremental heat changes that will enable you to cook swiftly and intuitively. Precise timing is further enhanced by a built-in minute minder, a clear LED display and the CountUp Timer which starts at zero and keeps counting until you stop it to monitor how long dishes have been cooking. 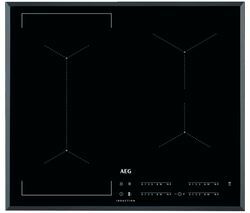 Our range of AEG hobs also includes the HG745451SM, which showcases the same quality engineering and smart functional design in a five burner gas hob. Again, you can expect high speed, efficient cooking, as well as automatic ignition that allows you to light your hob in an instant.